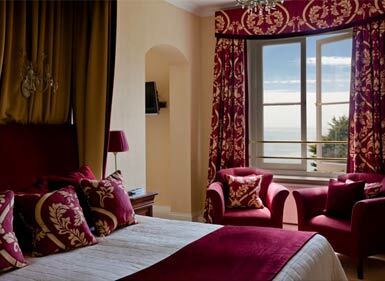 The Royal Hotel is the only AA 4 Star hotel on the Isle of Wight. It is located in the popular resort of Ventnor, which boasts outstanding views of the Island´s breathtaking southern coastline. If you are considering a holiday to the Isle of Wight, then make The Royal Hotel your first choice for a short break or longer visit to this fabulous Island. We make it our goal to ensure that every guest who stays with us has the experience of a lifetime. Over 70% of our guests have stayed with us before and we feel confident that having stayed with us once, you too will join the large number of guests who know and love the Royal and return year after year. Whether you are looking for a family holiday or a classic Isle of Wight hotel, you can be sure to find the perfect break in our luxury Isle of Wight accommodation. Having been established as hoteliers for over fifty years, we understand the importance of providing excellent cuisine and a professional service from warm and friendly staff in elegant surroundings. This attention to detail is reflected throughout the hotel with the sort of personal 4 Star touches that create a charming setting for your time spent with us in Ventnor. All 55 bedrooms at The Royal Hotel are individually furnished with private facilities. The accommodation has all you need to relax or work, including flat screen televisions and direct-dial telephones. Our standard rooms are decorated with beautiful fabrics and comfortable furnishings. All rooms are en-suite with tea and coffee making facilities, flat screen television and direct dial telephones. Our garden view rooms have the same facilities as standard rooms and overlook our well-tended grounds. Our larger superior rooms are individually styled with luxurious fabrics and furnishings and have stunning views over our beautiful gardens. Our family rooms are individually styled and can accommodate up to two adults and three children. Standard and Garden View family rooms are available and all rooms have baby listening facilities. One of the most important parts of your stay at The Royal Hotel. Our award-winning restaurant at provides an elegant backdrop in which to relax and enjoy excellent cuisine, attentive service and fine wines. All of which will compliment your Isle of Wight holiday perfectly. Our head chef and his team have been awarded two AA Red Rosettes for their outstanding cuisine for the last 10 years. Every dish on the menu features fresh local produce and are expertly prepared and beautifully presented. Lunch and afternoon tea are served daily in the informal setting of our Hamborough Bar and Terrace. Our tranquil veranda, with its backdrop of climbing geraniums, provides the perfect spot for relaxing with a cocktail or aperitif whilst enjoying the views of our stunning gardens. Our lunch menu offers a light bite to eat or a choice from our "Daily Specials". We are now working closely with the head gardener from Ventnor Botanical Gardens and have planted thousands of tropical plants. The gardens are bursting with an array of magical colours and for your comfort, we have purchased £50,000 of new garden furniture. We hope that you will enjoy these improvements. Sitting under the veranda enjoying an aperitif or dining out Al Fresco is an experience not to be missed.